A Data Management Plan (DMP) must be included with a full proposal and should describe how a project will conform to NSF policy on the dissemination and sharing of research results (see NSF 15-1 and NSF 16-1). 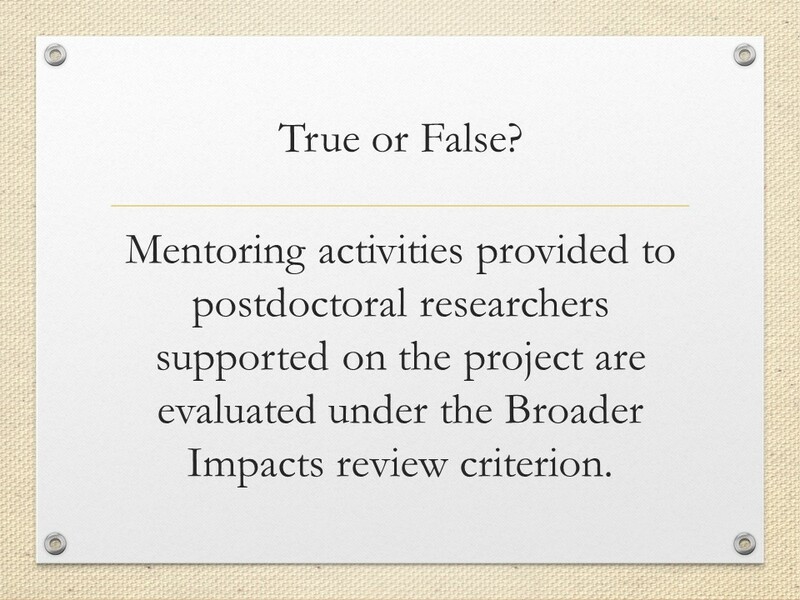 The DMP is evaluated as part of the Merit Review process, either under the Intellectual Merit or the Broader Impacts criterion, or both, as appropriate for the scientific community of relevance. BIO anticipates differences in data management practices across the many research communities we support and recognizes that not all data are appropriate for post-project dissemination or preservation. preparation of data (software/materials/etc.) for dissemination or deposit for future access. plans for depositing or archiving data, samples, and other research products to preserve access to them. In response to consultations with the scientific community and BIO’s Program Officers about data management, this updated BIO Guidance on DMPs is intended to clarify several required components identified in NSF policy. Please note that program-level data management requirements may be more specific or extensive than the BIO Guidance on DMPs, and you are advised to contact a BIO Program Officer if you have any questions related to a DMP in the program context. Future blog posts will address BIOData as well as changes in the newly released version of the NSF Proposal & Award Policies & Procedures Guide (PAPPG; NSF 16-1); the new PAPPG is effective for proposals submitted, or due, on or after January 25, 2016. 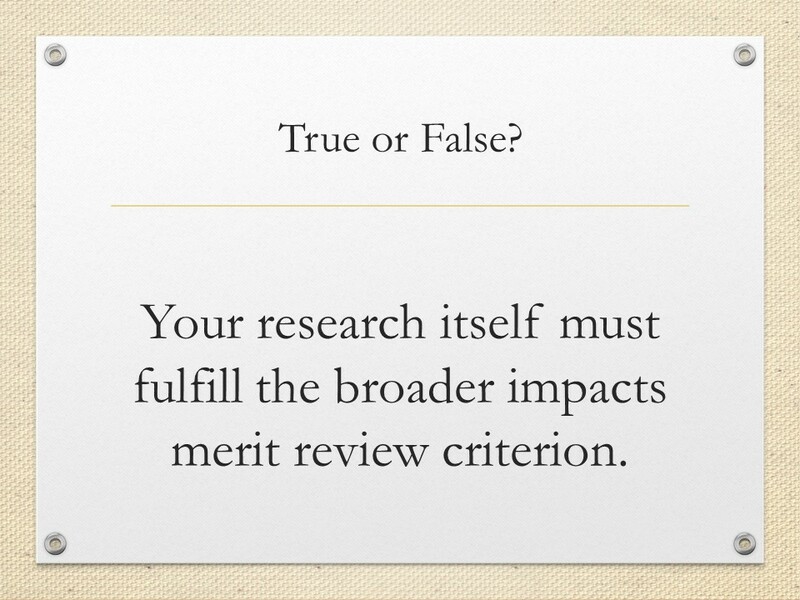 Are you looking for information about the Broader Impacts Merit Review criterion? 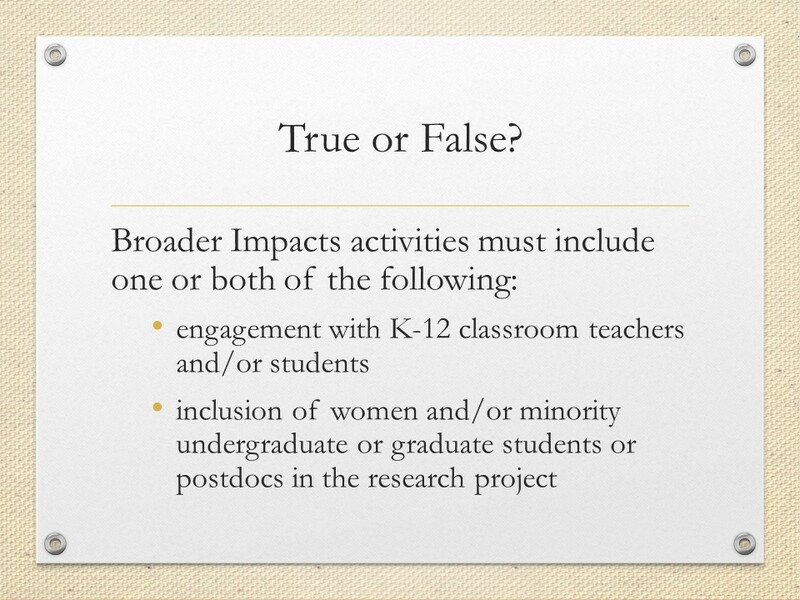 Not sure what qualifies as a Broader Impacts activity? Check out these resources and then take a quiz to test your Broader Impacts smarts! The Broader Impacts Perspectives brochure can be downloaded as a .pdf. The brochure includes highlights from the Broader Impacts Infrastructure Summit and examples of Broader Impacts activities. The GPG includes important information about the Broader Impacts and Intellectual Merit Merit Review criteria in a few different places: the Project Summary section (IIC2b), the Project Description section (IIC2di), and the Merit Review Principles and Criteria section (IIIA). The Grant Proposal Guide (GPG) is part of the Proposal & Award Policies & Procedures Guide (PAPP). 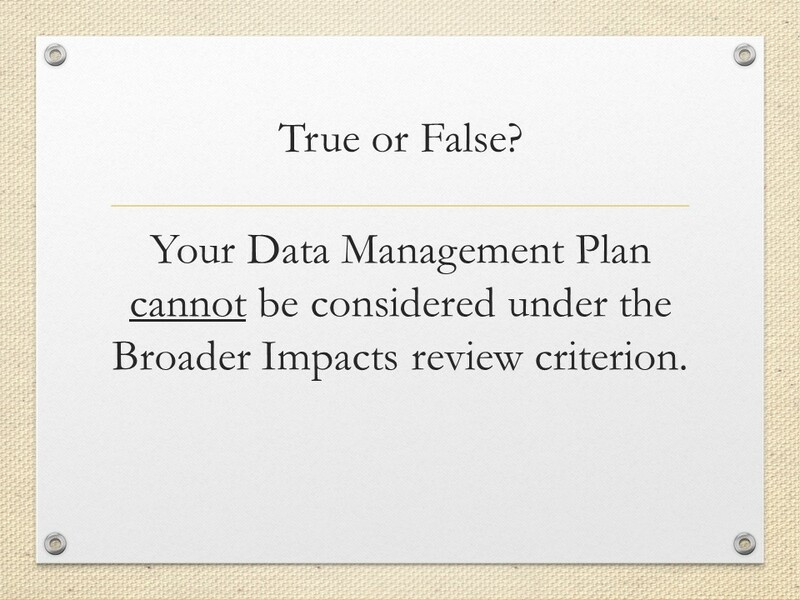 Review the resources above and come back and take our Broader Impacts quiz! Remember to share your stories about Broader Impacts activities with your Program Officer and via email to broaderimpacts[at]nsf.gov.